I traveled a hundred miles yesterday to attend a large rummage/craft sale in the Sanford Center in Bemidji, Minnesota. While I was somewhat disappointed in the sale items offered, I did find this awesome love seat or settee. It's from Mexico, and it's a twisted wire/wrought iron Peacock settee. I paid $80 for it. Definitely more than I usually spend for garden junk but I don't run across pieces like this often. Asking YOUR opinion. If it was yours, would you repaint it or would you leave the white rusty patina alone? More in my usual price range ($5) was this little three flower pot holder. It too has some rust but I may whitewash this because I prefer white to black. I also picked up a wooden pedestal bowl and two small stools that you will see appearing soon on my blog. I also got to see my youngest daughter, visit Hobby Lobby and Home Depot, and have a great meal! I'm sure you are all familiar with Country Living Magazine. I received an email last week from a Country Living online magazine writer asking if she could feature my 2016 junk garden tour with website readers. 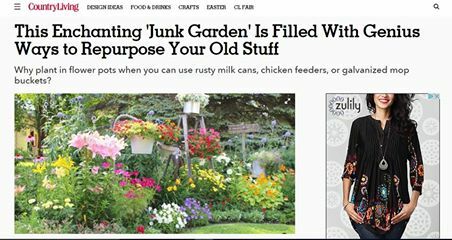 I agreed, and after asking me several questions, the Genius "Junk Gardening" Ideas story above left was shared on Country Living's website. If you would like to see the photos and story, click HERE. I would paint the settee at least to preserve it for a good while to come. Wonderful workmanship with all the curls and waves. Love reading all about your happenings. I would repaint it so I could put some nice cushions on it and sit on it once in a while! You could always take the cushions off when you weren't using it so that you could enjoy its beautiful lines. I like the patina, I would just protect it from rusting more. Congratulations on the feature! I love the settee as is..some protection from the elements as suggested, but it is adorable. I agree on the black piece, I also like it but I don't care for black out doors. Thanks for sharing. Have a fun week. It seems to me that most of what you do is to try and make things look aged just like this piece. Doesn't look too comfortable for sitting, but is architecturally beautiful. Think I would leave as is and use as a trellis, sweet peas maybe? congratulations on being featured in the Country Living online mag! regarding your settee, i think a pretty BRIGHT yellow, pink, or green would look great in your beaufitul garden! Wow, congrats on the Country Garden spread! Leave the settee as is. I can't wait to see more of your garden picture this year. The setter is wonderful...I like the idea of sealing the beautiful patina. Congrats again on your Country Living feature! Leave it ! It's perfect! Congratulations on Country Living! I also would paint it (white) Will help to protect it. More layers will hopefully keep it around longer. Work done now should mean less work for awhile! Make sure we get to see it in your garden even later this summer! Happy planting! Leave settee as is & protect as others have said. Congrats on the magazine feature! That's wonderful! Congratulations on the feature. What a wonderful bench.